Electronic Kits for serious use as well as for hobbyists. We recommend that a builder have some hands-on familiarity with electronic components, component identification/markings and some soldering experience; or work under the supervision of an experienced builder if trying your first kit. Kits Index Page Links below to over a hundred kits! New Kits in 2003 here! Including Ham Radio VFO and Receiver kits. New kits for 2004 will be introduced in May at the EDS in Las Vegas. The purpose of this page is to provide you with a search device so that you may (a.) look up a kit by number or (b.) find a kit by description or (c.) simply browse this page to see what you can find. There are links to catalog page copies from this page, so that you may see kits and read about them. New Kits in 2003 here! Protoboards Here. 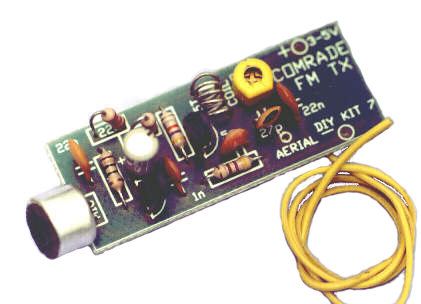 *see also page 202 for the "Internet Broadcaster" FM stereo transmitter kit. 80-122 ATMEL AVR PIC Programmer Kit. 80-141 High Accuracy Multi-Mode Timer kit. 80-270 One Watt Audio Amplifier module kit. 80-960 Serial PIC Programmer kit. 80-950 Happy Birthday melody kit. Need Speakers for your project? Speakers link.